In April 1792, Charles Grey joined with a group of Whigs who supported parliamentary reform to form the Friends of the People. Three peers (Lord Porchester, Lord Lauderdale and Lord Buchan) and twenty-eight Whig MPs joined the group. Other leading members included Richard Sheridan, John Cartwright, Lord John Russell, George Tierney, Thomas Erskine and Samuel Whitbread. The main objective of the the society was to obtain "a more equal representation of the people in Parliament" and "to secure to the people a more frequent exercise of their right of electing their representatives". Charles Fox was opposed to the formation of this group as he feared it would lead to a split in the Whig Party. However, by November eighty-seven branches of the Society of Friends had been established in Britain. On 30th April 1792, Charles Grey introduced a petition in favour of constitutional reform. He argued that the reform of the parliamentary system would remove public complaints and "restore the tranquillity of the nation". He also stressed that the Friends of the People would not become involved in any activities that would "promote public disturbances". Although Charles Fox had refused to join the Friends of the People, in the debate that followed, he supported Grey's proposals. When the vote was taken, Grey's motion was defeated by 256 to 91 votes. Some Whig MPs objected to Major John Cartwright being a member of the Friends of the People. They particularly disapproved of a speech Cartwright made where he praised Tom Paine and his book Rights of Man. On 4th June, Lord John Russell and four other Whig MPs resigned from the group in protest against Cartwright's continued membership. Some Whigs also became concerned with the growing militancy of those advocating parliamentary reform. In January 1792 Thomas Hardy, John Thelwall, and John Horne Tooke had formed the London Corresponding Society. The following year several supporters of parliamentary reform were arrested and tried for sedition. Several of the men, including Thomas Muir, Joseph Gerrald and Maurice Maragot, were sentenced to fourteen years transportation. 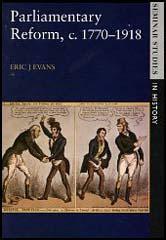 On 6th May 1793, Charles Grey once again introduced a parliamentary reform bill. Grey argued that one of the basic principles established by the Glorious Revolution of 1688 was the freedom of elections to the House of Commons. Grey added that "a man ought not to be governed by laws, in the framing of which he had not a voice, either in person or by his representative, and that he ought not to be made to pay any tax to which he should not have consented in the same way." Grey also attacked William Pitt, the Prime Minister, for the way that he exploited the present system. Grey pointed out that Pitt had created 30 new peers who nominated or indirectly influenced the return of a total of 40 MPs. Charles Fox and Richard Sheridan supported Grey in the debate that followed. Robert Jenkinson and Lord Mornington, spoke against. So also did William Pitt who argued that any reform at this time would give encouragement to the Radicals in Britain who were supporting the French Revolution. When the vote was taken, Grey's proposals were defeated by 282 to 41. Members of the Friends of the People now realised they had no chance of persuading the House of Commons to accept parliamentary reform and the group disbanded. Thomas Walker, a leading figure in the parliamentary reform movement, was arrested and charged with conspiring to overthrow the king, constitution and government. A trial was held at the Lancaster Assizes in June 1794. Walker was defended by Thomas Erskine. He was acquitted because the key witness, Thomas Dunn, was shown to have lied under oath. Soon afterwards, Thomas Hardy, John Horne Tooke and John Thelwall of the London Corresponding Society were arrested and committed to the Tower of London and charged with high treason. Although Hardy, Tooke and Thelwall were acquitted the government continued to persecute supporters of parliamentary reform. Thomas Clarkson said that had they been found guilty he would have moved to America. "For if it was looked upon to be treason to belong to such popular societies as the constitutional society or the society of the friends of the people... no one was safe."